Do some of your clients speak a language other than English? 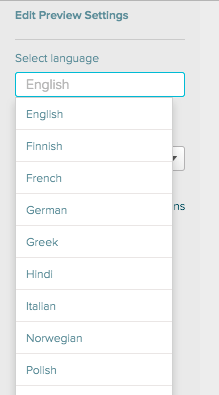 You can choose from one of 15 different languages to allow clients to see a translated interface. To change the language for a specific proposal, click on the preview button from the snapshot page. While previewing the proposal you can click Edit Settings and change the Language Settings. After you click on a language the page will reload and all of the buttons and other interface elements will show the appropriate language. Keep in mind that we don't automatically translate your proposal, title, or section titles, so if you want to write a proposal in a particular language you'll still need to translate it yourself. 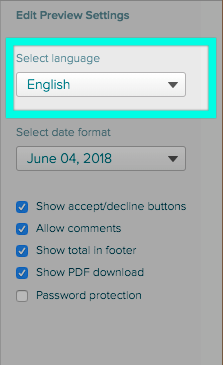 However any piece of text you can't control (Accept/Decline buttons, labels, error messages, email notifications and table footers) will get translated to the appropriate language. In the preview settings you can also select a date format from the drop down. This will let you decide what separates month, day and year ( / - .) and what order each appear in. This will automatically change generated dates in all newly created proposals, and any date variables you've used in a proposal, to use the format you've selected. When you edit preview settings for a proposal, only that particular proposal changes, it won't change the settings in other proposals. If you want to set the default proposal settings at an account wide level, go into the settings. See Client Preview Settings.